The full article in the British Go Journal is available here. It was while I was travelling to the Isle of Man Go Tournament that I received a strange telephone call from Jon Diamond ”Are you free for the week of October 5-9?”. I responded Yes, and my request for more details was met with ”I can’t tell you”. I was then contacted by Google DeepMind, who asked me to sign a Non-Disclosure Agreement; it was only after signing it that they would tell me what the affair was all about. DeepMind, a British Artificial Intelligence (AI) Company acquired by Google in 2014, had been developing an AI computer program to play Go. They reckoned that their program AlphaGo could beat any other software that was publicly available, and they wanted to test it against a professional Go player. 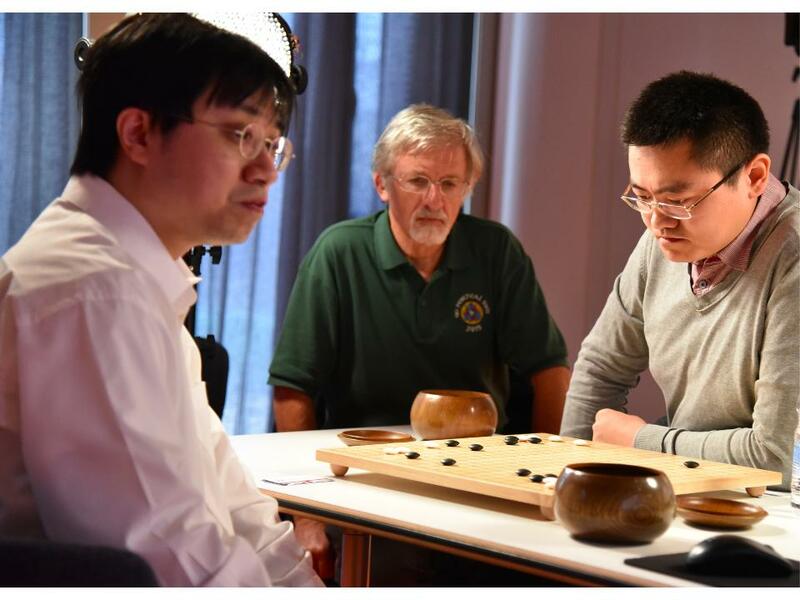 They were arranging a match against Fan Hui from Bordeaux (shown right in the photo, courtesy of Google DeepMind), who is one of the strongest players living in Europe; he won the European Championship for the third successive time at Liberec this year. They wanted someone from the British Go Association to see ”fair play” and Jon Diamond had ”volunteered” me! So in early October I went down to London to act as referee. In order to make the playing conditions as natural as possible - we all know that playing on a computer is not the same as playing on a board - the game was played on a normal Goban. Aja Huang (5 dan), a BGA member who works for DeepMind, placed the computer’s moves on the board, and then communicated Fan Hui’s moves to the computer. A representative of DeepMind pressed the clock. There were two separate matches, each of five games. During the mornings the time limits were 1 hour, with 3 periods of 30 seconds byoyomi; the afternoon games were played completely in byoyomi (also 3 periods, 30 seconds). The commentary below deals with the five games played in the morning, which are the ones included in the scientific publication Nature: Silver D. et al. Mastering the game of Go with deep neural networks and tree search. Volume 529, issue 7587, pp 484-489. Comments are by me, following a discussion with Fan Hui and Aja Huang, supplemented by some subsequent ones from Hajin Lee (a Korean professional). Unfortunately, since I didn’t record all the details at the time there might be some errors though... A slightly longer commentary is available in the BGJ article. Game 1 was very quiet, with very little fighting; I think Fan was trying to get the measure of AlphaGo. The crucial part came when Fan (Black) invaded at 43 and AlphaGo let him connect out; this seemed to result in White getting a wall that was not doing much. Indeed, this seemed to represent AlphaGo’s style: it is not very aggressive as long as it’s not behind. However, Fan then relaxed a bit, and when White played the sequence - to get the large yose in that corner in sente; the game was close. A tight yose resulted in AlphaGo winning by 1.5 points. Fan Hui used all his time and went into the third period of byoyomi; Alpha Go used about 45 minutes. Move 45 was a mistake, but Fan failed to take advantage of this: 46, instead of being a push along the top, should have been the push and cut 48 and 50, followed by throwing in one point to the right of 41. Fan then compounded this mistake by playing tsuke with 62. If he had played at 65 the game may have been easy. But with 70 (over which Fan took a long time) he had a choice: to live in the corner and give Black a lot of thickness which would nullify his own strength in the centre, or to sacrifice the corner and increase his dominance in the centre. After 136 the White group is alive, but all Black has to do is prevent White making a large territory in the centre. Black did this successfully and when it created the seki in the middle White had no hope and resigned. In discussion, Fan thought he would do better if the time limits were longer. In particular, AlphaGo was playing relatively quickly which further reduced the time available to Fan for thinking. The position on the right up to move 62 was bad for AlphaGo, which gave away a very large corner without gaining sufficient compensation. It could only win the game if it could used its thickness to attack, and in particular capture the two stones 33 and 35 in the centre. Move 60 was particularly crass (and one of the few times where AlphaGo seemed to make a particularly bad move); White cannot live in the corner and the response at 61 is a significant gain for Black. But then Fan made a catastrophic overplay when he played the kosumi at 65, which AlphaGo duly punished. A one-point jump at A or kosumi at B should have sewn up the game for him. Fan then compounded his mistake with 67 and then failing to make his group on the top right live unconditionally. Fan was extremely upset with himself over these blunders, and had to go out for a walk to compose himself. The fuseki moves 1-13 had been played in one of the afternoon games, but Fan played 14 in the lower right corner to see what AlphaGo would do. It immediately made a san-ren-sei, but then tried to turn the moyo into territory. The invasion at 32 was an overplay, giving White two groups to look after. He made both of them live, but Black 45 was painful, and both White groups are in poor shape. However, when AlphaGo played at 49 and threatened to play 51 or one point to the left of 32, White should sacrifice his group (at least temporarily), playing at 64 instead. After 165 a ko in the lower right hand corner develops (White at A, Black at B etc.) Fan recognised that he could not win the ko: not only does he have fewer ko threats, but if Black wins the ko it is in sente as AlphaGo then threatens to kill the corner by playing on the 1-2 point. The fuseki in this game had previously been played in the afternoon games on Monday and Wednesday. 41 was mistake. It was better to block at 50, since White pulling out with 46 created many problems. It was always going to be difficult for Black to attack the central White group with 93 etc successfully, (he should have played 94 first) and when the attack petered out Fan knew he was well behind. He struggled on for a while, hoping to salvage something from the wreckage, but eventually resigned as he was over 20 points behind. Hajin Lee, who commented on the first 4 games, said AlphaGo’s strength is truly impressive! I was surprised enough when I heard Fan Hui lost, but it feels more real to see the game records. My overall impression was that AlphaGo seemed stronger than Fan, but I couldn’t tell by how much. I still doubt that it’s strong enough to play the world’s top pros, but maybe it becomes stronger when it faces a stronger opponent. Last updated Fri Jan 29 2016. If you have any comments, please email the webmaster on web-master AT britgo DOT org.